If you read enough on your PC, have you noticed that in the evening / night, the reading may be heavier. And is that not only could end up bothering the brightness, but the blue hue of the monitor. During the day, computer screens look good as they are designed to look like the sun. But, at 9PM, 10PM, or 3AM, you probably shouldn’t be looking at the sun. F.lux is really helpful in this condition as it makes the color of your computer’s display adapt to the time of day, warm at night and like sunlight during the day. Almost all monitors have a color temperature of 6500K (Kelvin), which is considered a cold tone, where the white tends to blue. Warm temperatures (such as 2800-3500K) are so named because the white tends to be reddish yellow. It’s something that we can see quite well when we compare different types of light bulbs. Can range from 2700K (giving a yellow light), to 5500K CFLs or LEDs 6500 K, which tend to give a white light. The issue is that, during the day, a temperature of 6500K (which comes standard on monitors) is great because it is a good complement to the light of day, or even cold lights we use in the office. But at night, a temperature much light, this light may be, in some cases, annoying. Here come the F.lux in the limelight, F.lux: According to our location, calculate the time when the sun sets and gradually adjusting the temperature and the color of your monitor so that the transition from day to night, if We are constantly reading on screen is as smooth as possible. In short, it makes our screen fits over the color of the interior lighting (usually much warmer than daily light ). And when it is day, F.lux monitor automatically returns to the ideal temperature. Of course, not everyone has the same lighting in our rooms, so that through preferences, we can determine what type of lights used, so that F.lux fits properly. Check the following screenshot taken on Windows 7. F.lux is extremely useful for those who spend hours reading on screen. So are ebooks ( using the eBook Reader for PCs that we mentioned yesterday ), or blogs like Tricks Machine, F.lux can be an ideal solution. Do not try to day, where a yellowish probably be horrible and invite them to uninstall it immediately. Try it when approaching the sun, or when it was dark, with lights inside, without the sun in between. 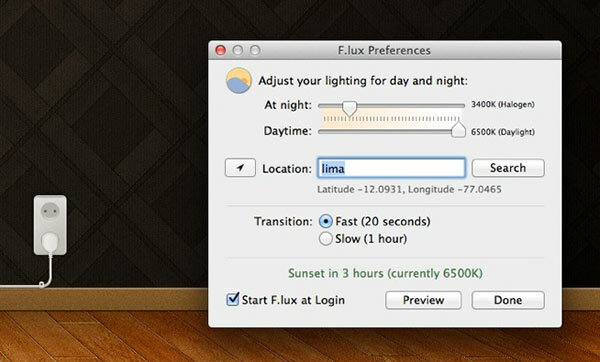 F.lux is available for Windows, Mac and Linux.